Following three years of painstaking research and field work, the Association of Hydraulics Services Consultants Research Foundation (AHSCARF) and University of Sunshine Coast (USC) have released a world-first online design tool – the ´Hydraulic Roof Drainage Modeling Calculator’ – which delivers comprehensive and verifiable design parameters for internal box gutters and downpipes in large buildings. John Power reports on this extraordinary new technology. The Hydraulic Roof Drainage Modeling Calculator is the culmination of years of hard work and dedication by some of Australia’s most skilled hydraulic services experts and academics. Throughout the modern era box gutter designs and parameters in large-footprint buildings (such as factories and warehouses) have been a thorn in the side of hydraulic consultants, not only because of the complexity of calculating water flow rate equations and behaviours associated with worst-case weather events, but also due to the limitations of A/NZS 3500.3, which references maximum flow rates of just 16L/sec. In the context of these twin hurdles, gutter box configurations and sizings have been an expensive and fraught element of building design, often resulting in adverse outcomes from either (a) highly cautious, over-engineered box gutters and excessive numbers and sizes of downpipes; or (b) under-engineered failures leading to drainage overflows and backflows, and causing significant property damage. Both the above outcomes, of course, are unacceptable and have huge financial consequences for both developers and occupants, adding greatly to construction and repair costs as well as insurance premiums. In 2015 the AHSCA National Technical Council (NTC) committed to finding a reliable solution to the problem of gutter box and downpipe design, based on genuine empirical research covering a range of flow rates well beyond the narrow confines of AS/NZS 3500.3. It was a bold ‘world first’ undertaking, and once a formal research partnership had been agreed with USC, Associate Professor Terry Lucke was appointed as lead researcher of the project. In 2016 the AHSCA established the AHSCA Research Foundation to replace the NTC and oversee the complex project, which involved practical experimental work at USC on a specially constructed multi-level test rig to measure thousands of sets of water flow scenarios. This rig allowed researchers to alter the length, gradient, width and depth of test guttering, while also observing different water flow behaviours under different roof pitch angles and with varying outflow positions (positive and siphonic pressures). Most crucially, the rig permitted real-life examinations of water flow characteristics at vastly different rates of flow – from 5L/s to a torrential 100L/s. This data was used as the basis for the Hydraulic Roof Drainage Modeling Calculator. As an online tool of great accuracy and credibility, the calculator allows for far more customised and consistent full-system box gutter designs, in keeping with hydraulic engineers’ longstanding preferences for higher-capacity gutter/outflow configurations (approved as Performance Based Solutions) that can withstand once-in-a-century downpours while rationalizing the drainage infrastructure required to meet this goal. The calculator, which was fully funded by AHSCA members at a cost of $0.5 million without any government support, is available only to participating AHSCA members in Victoria, South Australia, Western Australia and Queensland, and should provide trained users with an immediate advantage over competitors around the world. Mark Alexander, Chairman of the AHSCARF, says the fruition of the project is a milestone in the association’s history. As a precondition of registration to use the calculator, AHSCA members must first complete two training modules to refresh their skills and understand the scope of the calculator’s advanced hydraulic modeling capabilities. Stage 2 is currently underway; check with your State branch for more information. When using the tool, the first thing the user sees after logging in to the portal is a selection of 15 generic box gutter design options. These diagrams show the three traditional AS/NZS 3500.3 configurations, as well as a selection of 12 new Performance Based options developed especially for the calculator. The user clicks on the option most suitable for their particular project. This next step involves a pop-up box containing 11 blank fields, inviting the user to fill in the blanks with basic data pertaining to the project, for example: Left Box Gutter Flow Rate (L/s), Right Box Gutter Flow Rate (L/s), Total Flow Rate (L/s), Left Box Gutter Length (m), Right Box Gutter Length (m), Box Gutter Material, Gradient, etc. “And if you exceed any of the variables for the specific job design variable, the program stops you, so there is a series of inbuilt safety functions that keep the designer within the required design parameters,” Mark says, explaining that background self-referencing controls and thresholds actually rely on an immense databank of interdependent test results and cross-references built into the software. “Then click ‘Next’ again and it finishes the design for you,” he adds. “A screen with all the data you’ve put in the calculator appears, and another tab has a preliminary design image [complete with all dimensions] of your new box gutter, downpipe and overflow specs for reference. Click Finish Design and plug in job details, job name, state, job class, and other details so the system can prepare a project-unique verified hydraulic model. The entire process, depending on the user’s preparedness, can take just a few minutes to complete, compared with hours to derive a solution using old-fashioned and inaccurate methodologies. The tool can be used on desktop computers, laptops, smartphones, tablets, or any other handheld device. Even more important than the convenience of the calculator tool, Mark stresses, is the reliability, fitness for purpose, and accuracy of the solutions. Ben Rimmington, AHSCA Research Foundation Director, says users of the calculator can have renewed confidence in their Performance Based designs, thanks to the effective removal of margins of error in every freshly designed system – regardless of flow rate. 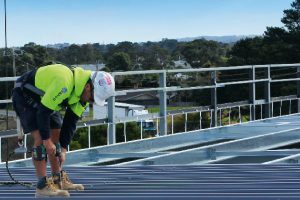 Even at the most cursory level, the calculator has the capacity to save tens of thousands of dollars per project by optimising the design, number and performance of uniquely configured gutter fittings. The calculator also provides significant engineering time savings, which has caught the attention of some of Australia’s largest engineering firms, even for standard ‘deemed to satisfy’-style designs. “For example, you might have an instance of a job with 40 downpipes,” Ben says. “Now, as a result of being able to offer an alternative system where you don’t have that 16L/s limitation, then those 40 downpipes might end up being just six downpipes, as a result of the research. These savings quickly multiply with the reduction of in-ground stormwater drainage and the reduction of designated surcharge pits. So, now that the Hydraulic Roof Drainage Modeling Calculator is operating, does that mean the test rig can be shut down and research abandoned? “Absolutely not,” Mark and Ben say, agreeing that the release of the calculator represents the beginning, not the end, of what can be achieved for AHSCARF members. Thanks to its online format, the calculator can be refined and upgraded continually with additional data and functionality. There is also potential to examine higher flow rates (up to 150L/s), changes in gutter direction (corners), valley gutters, while also undertaking further work on grated outlet performance. Most promisingly, Ben says, work has just begun on residential eaves guttering systems, which represent an entirely new class of research. Research infrastructure is already in place for this project. “There is likely to be 10 years worth of research projects just to do with roof drainage,” Ben suggests. As stated, the Flow Design Calculator is available only to AHSCARF members from participating States. Calculations attract a fee per design, determined on a sliding scale according to the flow rates nominated in each design. These costs will inevitably be passed on to clients; however, the AHSCARF expects the marketplace will readily identify and embrace the obvious returns on investment derived from superior design configurations. In an age where so many industry associations define their achievements according to lobby lunches and Nearest the Pin competitions, the AHSCARF’s exploits in partnership with USC researchers are astounding. Not only has the association created a user-friendly, world-first design tool for its members, but it has done so under its own terms and without external funding. We look forward to reporting ongoing breakthroughs in the Foundation’s research projects.